Play loose, defend with all you have, play with grit, be smart and make shots. Tuesday night before a super crowd at the Rochester Community Center, 14th-seeded Merrimack High went four for five and fell just short, dropping a 45-37 decision to No. 3 Spaulding. 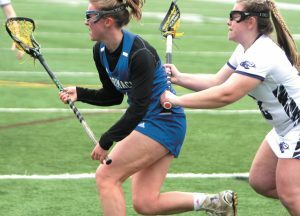 The heart, the defense, the effort et al, somehow despite some woeful offensive stretches, had Merrimack in position to tie late, twice in the final two minutes to be exact. Trailing 40-37, Jack Tarleton lofted a dead-on three from the baseline that rattled two-thirds of the way down and finally caromed out. The second Merrimack look wasn’t as good and with Spaulding in the double-bonus (of course! ), the host Red Raiders pulled away to survive. “Most any playoff game is a battle. We’ve been on the other end of it to, the 2-3-4 seed playing a team with nothing to lose,” said Goodridge. “They give you everything they’ve got. There was a lot of pressure on them. They’re expected to win. “There was a little more urgency,” said Goodridge. After the break, Jared Dyer scored nine of his 11 points, and Pat Yudkin had six of his game-high 13. But the deficit was a tad much to overcome, under less than favorable conditions whistle-wise. Spaulding was hit with a total of seven fouls on the night, sending Merrimack to the line for a total of four attempts. Meanwhile, the visitors were hit with 20 personals, plus a technical, leading to 20 Spaulding free-throw tries.